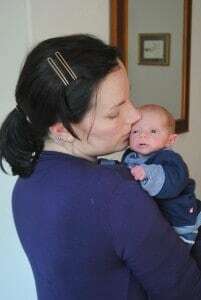 Some mothers find their experience of having a baby is very different from the vision of motherhood we see so much of the time. Having challenges, even feeling overwhelmed, is a normal experience. What about household responsibilities and older children? The early weeks and months of caring for a new baby can be an emotional time. It can be confusing to experience the emotional ups and downs— adjusting to being a mother takes time. Pain, tiredness, your birth experience, and how much support you have can all affect how you feel. When the reality of being a mother differs from your expectations, this can add to the feeling of being on an emotional roller-coaster. 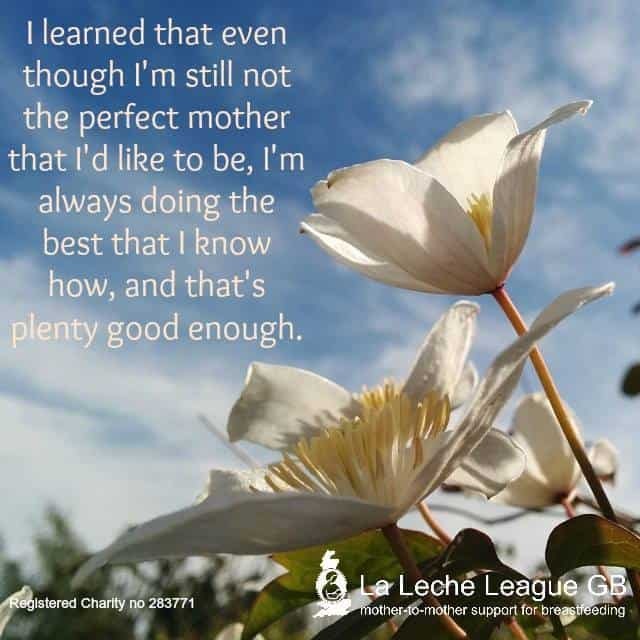 As well as experiencing ‘baby blues’, most mothers have days when they feel overwhelmed by the responsibility of caring for a new baby. The suggestions here may help you find ways of feeling more in control, however old your baby is. The responsibility of looking after a baby 24 hours a day can be quite overwhelming at first. Try to relax—you will soon learn what he needs and enjoys. The easiest way to care for a newborn is to accept and meet his need for closeness. After a while you will find gentle patterns emerging. You can then build on these patterns, creating a daily rhythm to suit you both. Bring your baby into your room or bed to get more rest. See further reading for information on safe sleep. Some mothers plan ahead and ask for assistance with everyday household tasks, childcare, snack and meal preparation. Taking friends up on their offers of help can ease the strain. Having a list of simple tasks ready can make it easier to accept offers of help. Save your energy for vital tasks. Not all housework is equally important. ‘Baby blues’ is a mild, temporary condition associated with the falling hormone levels after birth. Around 30 to 85 percent of all new mothers experience ‘baby blues’, which usually start around 3 to 5 days after delivery. Some mothers simply find that they burst into tears for no apparent reason; others may experience mood swings, confusion, forgetfulness, headaches, negative feelings towards the baby, restlessness, irritability and nightmares. Fortunately, this condition typically lasts only a few days. Rest and sleep: It’s important to give yourself permission to rest and sleep: you have just done a major job in growing and giving birth to your baby. Try to set aside at least a week or two of recovery time. Breastfeed often: Breastfeeding and close physical contact with your newborn produces soothing hormones designed to calm you during these early days. Rigid schedules can have the opposite effect of causing more stress. Hold your baby: Try Biological Nurturing™—‘laid back’ positions can help breastfeeding go well and make you feel calmer and more confident. Spend time together: You may want to create a comfortable place for you and your baby to spend lots of time together, with as much privacy as you need. Limit visitors: It’s OK to limit visitors; you could ask your partner to explain that you’re tired or put a sign on your door ‘new mum and baby resting, please call back in a few days time’. If you’re wearing your dressing gown, or are in bed with your baby, visitors are less likely to overstay their welcome, and may even bring you a cup of tea. Plan ahead: Use an answerphone or set your mobile on silent to allow you to rest without being disturbed. It’s very important to talk to your GP or health visitor if any of the negative feelings become intensified or if they last more than two weeks—for instance, if you feel overwhelmed, worried or cannot sleep. Depression in new mothers is not uncommon, and a lot of help is available to support mothers and their babies for whom this is a problem. If recognised and treated, mothers recover quite quickly and are then able to fully enjoy parenting their new baby. Medications are available which are safe to take while breastfeeding. Our Professional Liaison Department can give you information about whether a specific medication is safe to use while breastfeeding, contact a local LLL breastfeeding counsellor or call our National Telephone Helpline for help. Homestart is a national family support charity that offers help and friendship to families with young children who are struggling to cope for whatever reason. Fresh air and sunshine are good for your well-being. Most mothers notice the importance of daily exercise for lifting their mood—it can be as simple as a short five to ten minute walk in the early weeks. Going out with your baby can also prevent you feeling isolated and give structure to your day. 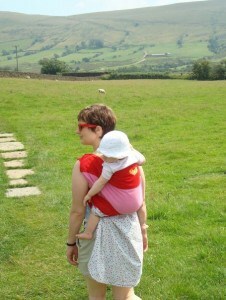 Before long you can take your baby for outings to the local park, and visits to the library and shops. Don’t try too much too soon though. Work up slowly. You could also start doing gentle, fun things with other mothers and babies eg baby massage, singing or swimming. Eating wisely can make a difference, including healthy snacks. Eating a well balanced diet that includes foods such as wholegrain bread and cereals, pasta, potatoes, rice, vegetables, beans and raw fruits, will help keep your blood sugar levels steady, protecting against depression and fatigue. Long-chain Omega-3 fatty acids EPA and DHA in your diet can help you cope with stress and may prevent depression. Sources include oily fish and enriched foods. Consult your doctor if you are considering taking supplements. Drink to thirst, and enough to keep your urine pale. Water is good, as is a daily glass of fruit juice. Avoid or limit alcohol, caffeine and fizzy drinks. Eating foods that include milk, bananas or complex carbohydrates before going to bed can help you sleep. Make yourself a priority when your baby sleeps: care for your own needs, including sleep and rest. The relaxation techniques you may have learnt for labour can be used now when you have a few minutes. You deserve time for yourself: make time for a bath, shower, to read a book or magazine, or watch a DVD while breastfeeding and cuddling your baby. Postnatal exercises are helpful, but avoid over-exerting yourself. Pain and tiredness can increase negative feelings. Enjoying the company of other mothers, either face-to-face or online, can make you feel better. 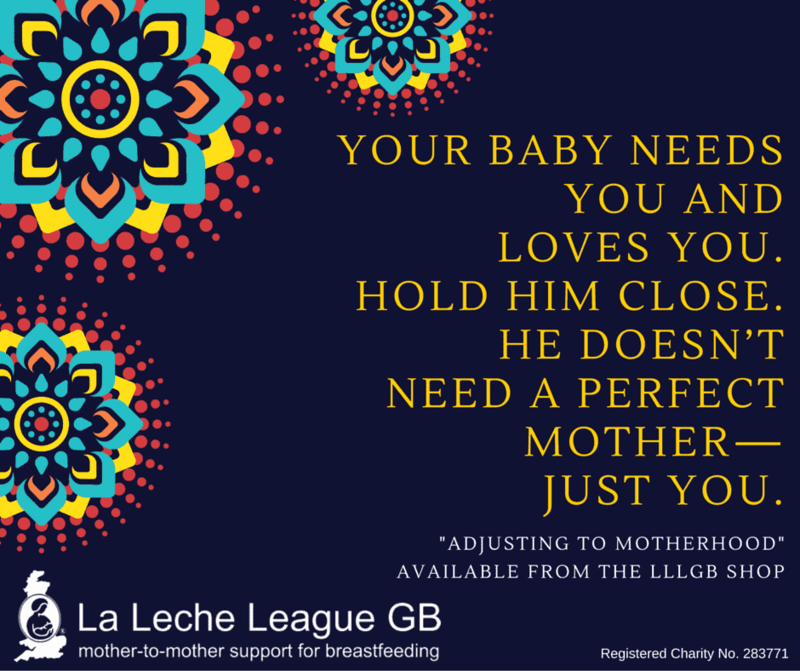 Local LLL meetings are a good place to talk to other breastfeeding mothers, as are our online Facebook Groups. Children and Family Centres across the country also offer support and information to all parents. Seek prompt help for any breastfeeding problems, as continued pain can make you feel very low. What about talking to someone sympathetic? By talking about how you feel you may find ways of managing. Try to tell your partner what you need as it’s not always easy for others to know what you’re experiencing. Hand squeezes, hugs and positive words can go a long way. Try to listen to your body and pace your activity to your energy level. As your baby grows, there will always be days when a rest or sleep while your baby sleeps is a good idea. Keeping up with a crawling baby or active toddler is hard work. If you’re feeling low remind yourself your baby needs you and loves you. Hold him close. He doesn’t need a perfect mother— just you. Written by April Whincop, Karen Butler and mothers of LLLGB. Photos courtesy of Rebecca Coyle and Fiona Simkiss.